I just got an award!! 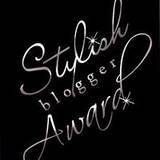 Lovely Shay from Wonderfully Chaotic just awarded me with the Stylish blogger Award! It is the little things like this one that show that you are doing something right (blogwise). Shay, Thank you so much!! You’ve made my day! Thank and link back to the person who awarded you this. Pay it forward to 15 recently discovered great bloggers. Contact those bloggers and tell them about their Blog Award! I’m turning 26 in 1 month!! The Three Musketeers, by Dumas is my favorite book ever. Our room will get a makeover!! Yeah, we are going with grays and purples! 😀 This is so exciting! I am really good at finding viruses (on the computer). I find them, not the other way around, oops! I have decided to teach myself how to sew. Problem is, I have no sewing machine! Little set back, huh? Doesn’t matter how hard I try, I just can’t keep my desk clear! It is a complete mess. I have never cleaned my oven. And we moved in almost 2 years ago. Any suggestions on a VERY good oven cleaner? And that’s all I can think off at the top of my head! Sorry! Argh, This reminds me, I have to vacuum the stairs….argh! Hehehe every spring I try to convince myself to clean the oven, but I just can’t get myself to do it!! Thanks for the award. I really appreciate it!! It’s so funny, I just followed you on twitter and then saw your email. I taught myself how to sew this year and I have loved it!! You should do it! !